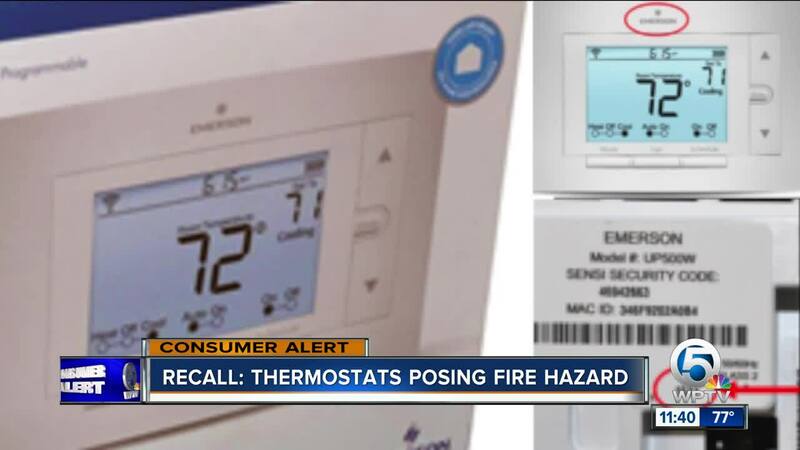 Emerson branded SensiWiFi thermostats recalled for fire hazard. A fire hazard has prompted a recall of 135,000 Emerson-branded SensiWiFi thermostats. The thermostats have “Emerson” printed on the front and a date code from 1416 to 1536 on the back. The date code represents the manufacture date from the 16th week of 2014 through the 36th week of 2015. The thermostats are white with an LCD screen. There are three buttons below the thermostat screen. Up and down arrow and Menu buttons are located to the right of the screen. Recalled thermostats have model numbers 1F86U-42WF or UP500W. A product label containing model number and date code information is located on the back of the thermostat. Consumers should immediately check their Sensi thermostat to determine if “Emerson” is printed on the front with a date code from 1416 to 1536 on the back. The termostats were sold at Johnstone, Home Depot and Golden State FC stores and Heating ventilation and air conditioning (HVAC) equipment distributors nationwide from April 2014 through December 2016 for between about $90 and $150. CLICK HERE or call toll-free at 888-847-8742 from 7 a.m. to 6 p.m. CT Monday through Friday for more information.